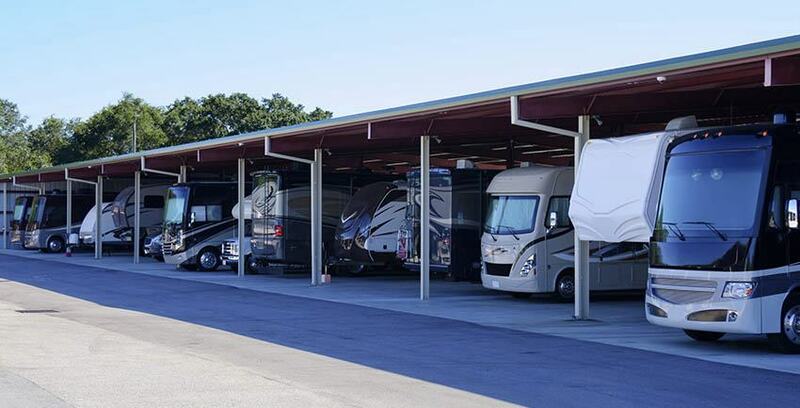 Please check with your RV owner’s guide for guidance while putting your vehicle in long-term storage. The following tips do not cover all makes and manufacturers and are only meant to serve as broad-based suggestions. No Food! Be sure and to clear the fridge and all the cabinets and cubby holes of anything that might spoil or be a magnet for bugs or rodents. Prop the Refrigerator and Freezer Doors Open. This will help avoid mold or mildew buildup if there are any wet areas after you take all your food out. If your RV has a washer, make sure to prop the door on that open as well. Turn Everything Off. This can help prevent accidental fires and a dead battery. Shades down. Prevent sun damage to your fabrics and finishes by closing all blinds and window coverings. Empty graywater and wastewater tanks. Aside from the potential odor problem, you’re also preventing damaged pipes if you’re storing during the colder months. Turn off and remove propane cylinders. Your Climate Storage lease prohibits the storage of flammables and explosives on our site plus you’re minimizing the chances of an accidental fire. Cover it up! - If you have a cover that will protect your RV, put it on, and tie or weight it down. Insurance - contact your insurance agent and make sure your vehicle is fully insured. While we do everything we can to minimize the risk of damage to all our customers’ items, accidents may happen. Remember, Climate Storage does not cover your RV for any damages or accidents.